I’m sure people have written about MySpace and tagging, but this is absurd. 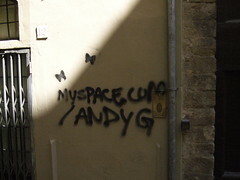 How did AndyG, a 25 year old hip hop artist from Orange County (or a fan) decide to promote his music on an ancient building in Florence? If this graffiti artist had read the plaques before tagging, s/he could have actually put this advertisement on the birthplace and childhood home of Michaelangelo, which was right across the alley. This entry was posted in Travel and tagged graffiti, MySpace. Bookmark the permalink. just some advice, I agree with you however I think you’re only giving him what he wants by placing the photo on your site. I would blur the myspace url. And while you’re at it, forward any personal details that may be on the profile to authorities. you can’t necessarily assume with any certainty that is was definitely Andy G who wrote it.